Review copy provided in exhcange ofr an honest review. 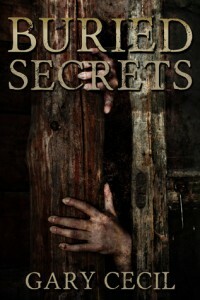 *BURIED SECRETS* will keep you wondering to the very last page. At approximately 2,800 words, this spine-tingling horror tale is guaranteed to make you laugh and squirm, as the young couple realize… they’re not alone. Max and his wife, Megan, just moved into their new home. It’s a charming Victorian, that did not come with the typical Victorian price tag. Sure, it needed some paint thrown on here and there, but soon–with a baby on the way–it would be the perfect home for their family.Things quickly begin to change, though. They hear things at night, and even feel things crawling in their sheets. But that’s not the worst of it. There’s a foul smell in the air sometimes, and something even fouler in the basement.Something smells, licks, and lingers in the walls and down in the basement. When the power goes out, Max goes into the basement to find the breaker, and what he finds, is something much worse. *Can the young couple survive this horrible fate? Or… are some secrets just too damned evil to be kept buried alive? Buried Secrets had potential, but the execution is flawed, and overall, the story is pretty ‘meh’. There’s an introduction at the start, “About Buried Secrets” which intends to give us some back story, but which serves to almost immediately deny the reader any fear they might’ve felt while reading. The story is fairly typical, a little unoriginal. Couple moves into new home (which is actually a very old home), weird stuff starts to happen, and instead of acting like any normal person would, they still continue to live in the house, and pretend nothing is happening for a while. Why Hollywood and authors tend to think that if someone crawled on your sheets at night, you wouldn’t freak out and get the hell out of there, is beyond me. But apparently that’s not the way this works. Ignorance is bliss. The story is written in a weird font, like it was written with an old typewriter. At least that’s how it looks on my .pdf. Didn’t like it all, but okay, I’m willing to look beyond that. I have the feeling this story is the author’s first attempt to write a story. It’s not all bad. The plot could be interesting, but the writing needs a lot of work. There’s a reason why they say you shouldn’t publish your first book or story, no matter how good you think it is. I’m not sure the author hired an editor, but if he did, that editor should’ve told him the book needed work. The characters are flat. They have no personality. Even in short stories, you should at least make us care about the characters. The story jumps from point a to b without much explanation. Some scenes are irrelevant, others that should be relevant, are simply skipped. Overall, I’d lie if I say I enjoyed the story. It had potential, but misses every ball. With a good editor, another round of revisions, and some polishing, it could become interesting though. Very good statements of why this book didn’t work for you. Especially the part about going from part a to b, with no explanation and irrelevant scenes. I never heard that you should not publish your first book, lol. However, it seems like good advice. My first thought when you said they don’t use contractions is that maybe this was for NanoWrimo and they wanted to get the word count up, but who knows? Thank you for this terrific analysis.